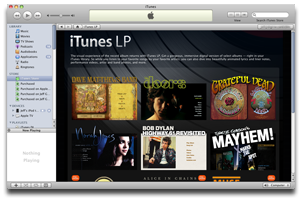 Apple will likely be showing off a new addition to the iTunes Store at its special media event on Wednesday: iTunes LP. The new feature appeared on the iTunes Store ahead of the event, and it looks as it requires iTunes 9 -- still unannounced -- as well. Rumors surfaced before Apple's event that it was working with record labels to bring a more complete album experience to the iTunes Store, complete with videos, extra liner notes, and photos, and that looks to be exactly what iTunes LP delivers. The iTunes LP page at the iTunes Store lists several albums already including Bob Dylan's Highway 61 Revisited, Norah Jones's Come Away with Me, and The Doors: 40 Anniversary Mixes from The Doors. Album pricing looks to range from US$9.99 to $19.99. Apple will be hosting a music-related media event later this morning where the company is expected to unveil updated iPod models. So far, the company has been tight-lipped about what it will introduce, but may have tipped its hand earlier in the morning when it lowered the prices for the iPod touch, iPod nano and iPod classic. Apple's media event is scheduled to kick off at 10AM pacific time in San Francisco. The Mac Observer will be on location providing live coverage of the event.